Today is the anniversary of "Black Tuesday", also known as the 1929 Stock Market Crash, which precipitated the Great Depression in the United States and the Western world. (And this year it actually fell on a Tuesday again.) Hundreds of businesses and banks closed, and many people were out of work and unable to support their families. From a genealogical research perspective, this can mean that families were broken up and could be living in multiple locations while parents scrambled to find ways to support themselves and their children. It is important to keep this in mind when searching for family members in the 1930 census. 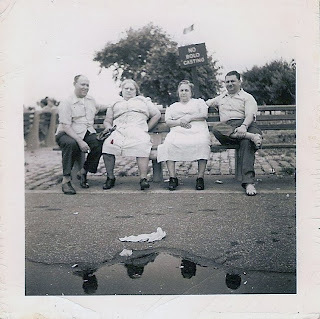 I found my paternal grandfather's family, consisting of four people, in four different locations. My grandfather was back living at home with his mother and two siblings, working at the large textile mill which provided most of the employment in that town. His older daughter was in the county children's home. His younger daughter was in an entirely different county, boarding with a well-off family otherwise unconnected to my family. (No one has been able to tell me how that connection was made and how she ended up living with them.) And the girls' mother, my grandfather's first wife, was living in that second county near her daughter, working as a live-in private servant to another unconnected family. How did the Great Depression affect where your family lived? October, which is Family History Month, is always a busy time of year for genealogists. Along with attending a few events, I let myself be scheduled for several talks, including five in six days. (You'd think I would have learned my lesson by now!) It's been a great month, and I learned and shared a lot. 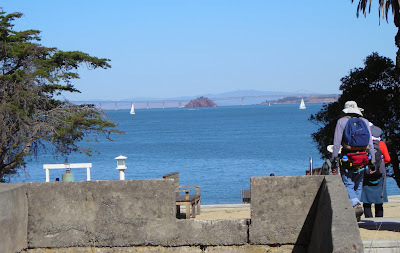 I started the month by going to the October 5 Angel Island Family History Day coordinated by the California Genealogical Society. I very much enjoyed the event and the opportunity to learn about some of the different groups of immigrants who were processed at the "Ellis Island of the West." And because it was the beginning of the month, I actually had time to write a separate post about it! Saturday, October 12, was Family History Day at the California State Archives. I was asked to give a talk on online newspaper resources, which went very well, with about 75 people in the class. I also was able to attend three classes myself. I took the opportunity to hear Lisa Lee's "Introduction to Black Genealogy" because although I've been researching black genealogy for many years, I had never taken an introductory class. She had a lot of useful information and different perspectives from some other people I've spoken with. I also attended sessions on Cherokee and Italian research, plus I took a tour of the archives. Did you know the archives holds all the historical records for San Quentin and Folsom prisons? Makes me wish I had a serious reprobate to research. On Wednesday, October 16, I taught a class on Jewish genealogy at the Oakland FamilySearch Library for International Jewish Genealogy Month. Instead of a general introduction to research, this class focused on what differentiates Jewish research from that of other groups. The class had a good turnout, and someone who couldn't attend contacted me afterward to get information. Even better, one of the people in the class is already following up by doing more in-depth research! The Mt. Diablo Genealogical Society's October speaker canceled at the last minute, and they asked if I could step in. Lucky me, I was able to do it because of the short BART strike. (It kept me off the streets and out of trouble!) So on October 18 I gave a presentation on how even if you have very, very little information to begin with, if you work methodically and thoroughly, it is possible to build on that small beginning and find documents and more information. In the case study I discussed, I started with one person's last name, another person's first name, a third person's occupation (but no name! ), and a town, and my research resulted in a seven-generation family tree with more than one hundred people. The Concord FamilySearch Library and Contra Costa County Genealogical Society held their annual "Digging for Your Roots" seminar on Saturday, October 19. I taught two classes there, online newspapers and finding women's maiden names, which were both well received. I was able to attend several sessions, with the standouts being about Germans from Russia and overlooked military sources. They both had a lot of useful information I had not seen before. The San Francisco Bay Area Jewish Genealogical Society (SFBAJGS) held its final 2013 East Bay meeting on Sunday, October 20, at the Oakland FamilySearch Library. At this all I had to do was open the library and set everything up! Lisa Gorrell of the Contra Costa County Genealogical Society gave a talk on city (and other) directories and how they can be helpful in genealogy research. The final 2013 SFBAJGS meeting for our peninsula location was Monday, October 21. After several years of trying to work it out for me to give my talk about online newspapers there, I was finally able to make it down to Los Altos. Several people who attended e-mailed me within the next couple of days to say they were already finding articles about their relatives — just what I love to hear! The first organizational meeting for the 2014 San Francisco History Expo was Tuesday, October 22, at the Old Mint, where the Expo is held. I went as a representative of SFBAJGS and . . . um . . . somehow ended up volunteering to be on the organizing committee. (Oops.) I figured it was the best way to make sure that all of the genealogy groups get to stay together in one room, which has worked well the past two years. And last but certainly not least, this past Saturday, October 26, the California Genealogical Society held a big fundraising event, Their Roots Are Showing, its take on a Who Do You Think You Are? type of production. Three local Bay Area celebrities — Billy Beane of the Oakland Athletics, drummer Tim Alexander of Primus, and Olympic swimmer Natalie Coughlin — learned about their ancestors live on stage. I did research on Beane's and Alexander's families for the event, and I was able to meet them in person, which was pretty cool. And now I have a short break until November 2 (yikes! that's this Saturday! 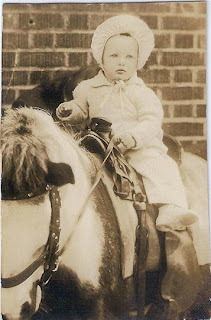 ), when I'll be teaching two sessions at the Sacramento FamilySearch Library's genealogy seminar. have four (4) grandparents from the same sub-Saharan African country. Countries of interest include Angola, Benin, Cameroon, Côte d'Ivoire, Democratic Republic of the Congo, Ghana, Guinea, Guinea-Bissau, Niger, Nigeria, Senegal, and Sierra Leone. *Please note that we cannot ship or provide services to residents of the state of Maryland. Only one free kit is permitted per family. Family members of existing 23andMe customers are welcome to enroll in the project but are not eligibile for a free kit. 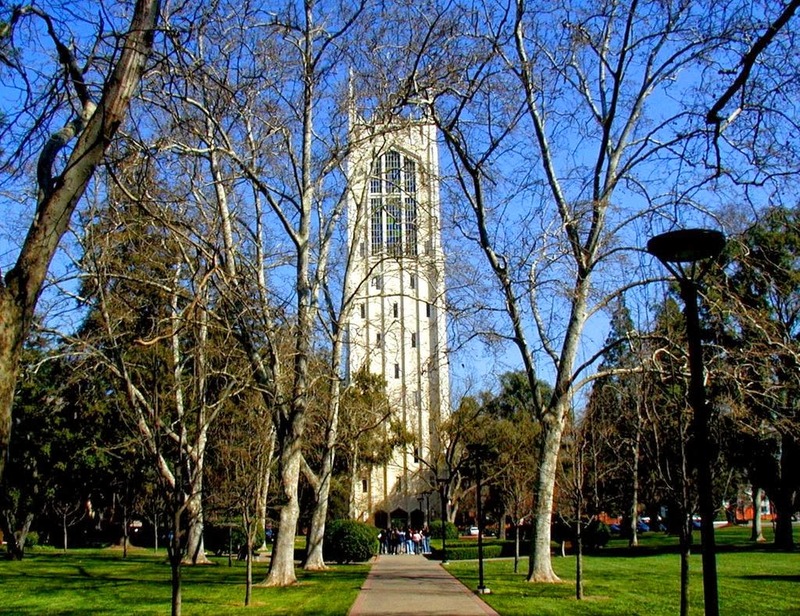 The San Joaquin Genealogical Society is presenting a free seminar on Saturday, February 22, 2014 at University of the Pacific in Stockton, California. Cosponsored by the California State Genealogical Alliance and University of the Pacific's Jacoby Center for Public Service and Civic Leadership, this is a great opportunity to attend four interesting talks at no cost, hang out with other genealogists, and learn more about the Alliance. I'm looking forward to the event and hearing the other speakers. They're all covering topics I haven't heard before. Even though the event is free, registration is required to receive the packet of speaker handouts, and seating is limited to 180 attendees. More information and the registration form are available online. If you have any questions or cannot register online, contact Sheri Fenley at (209) 373-6847 or sherifenley@gmail.com. After 24 years of living in the San Francisco Bay area, I finally visited Angel Island last week. I have been wanting to go for several years but somehow never managed to schedule it. Luckily for me, the California Genealogical Society (CGS) coordinated a family history event this year for Family History Month — plus asked me to help find someone to speak about Jewish immigration through the island — so circumstances worked in my favor. It was also a "chamber of commerce day" — gorgeous weather, clear blue sky, the kind of day convention and visitors bureaus send out their photographers to take promotional shots. The ferry ride from Oakland to the island (with a change of boats at the Ferry Building in San Francisco) was very enjoyable, and there was even a great view of the new eastern span of the Bay Bridge on the return trip. The station has several points of interest. CGS posted a helpful map of the station online. There are informative signs throughout the area, describing not only the buildings (and former buildings) but also activities of people who were held on the island. Just inside the gated entrance are what remains of employee cottages that were designed by the famed architect Julia Morgan. It's a shame they didn't survive. Down by the water at China Cove was the dock where immigrants arrived (it was torn down years ago). An administrative building used to be there also, but all that's left now is part of the foundation, showing the footprint of where the building was. A fire in 1940 destroyed the building and caused the closure of the station. A small plaza and an Immigrant Heritage Wall have been built at the cove as part of the renovation of the park. Nearby is the hospital, which is not open to the general public yet but is under renovation and scheduled to open in 2016. While we were there a group of nurses was given a private tour of the hospital. 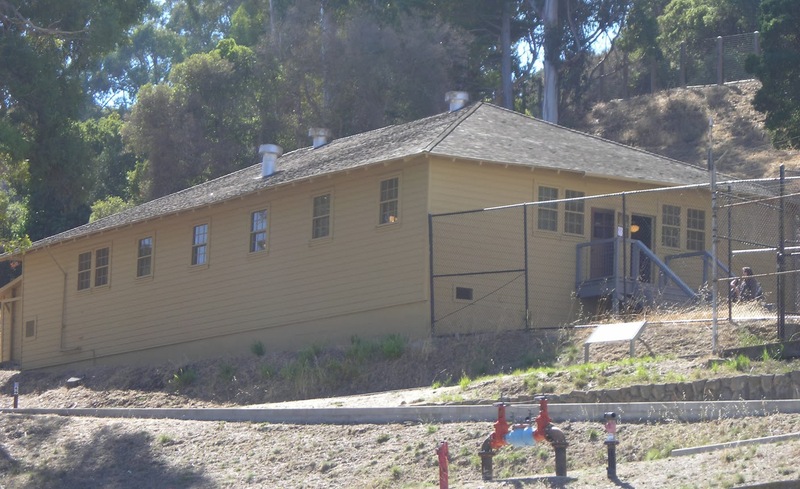 The two buildings that are currently open are the main immigration barracks and a World War II mess hall. Several interesting displays, mostly about Chinese immigration, were set up in the immigration barracks for the family history event. One of the docents had brought a lot of his own materials to share with attendees, and one of the speakers brought her research documents. There were also tables with informational material from CGS and the San Francisco Bay Area Jewish Genealogical Society. The mess hall is where the presentations took place. Grant Din (staff at the Angel Island Immigration Station Foundation) and Kay Speaks (genealogist) spoke about their Chinese ancestors who were processed at Angel Island. Roslyn Tonai (executive director of the National Japanese American Historical Society) talked about her mother's family, Japanese immigrants who came through here. And Maria Sakovich (independent researcher) described the paths across Europe and Asia that Jewish immigrants took during World War I and II that led them to Angel Island. All of the speakers had interesting stories, and I'm glad I had the opportunity to learn from them. In a nice bit of serendipity a woman who works at the Tenement Museum in New York City happened to be on the island as part of her vacation in California. She is very interested in genealogy outside of her job, and she was thrilled to find out that there was a family history event going on. We had trouble deciding who the biggest genealogy geek was. 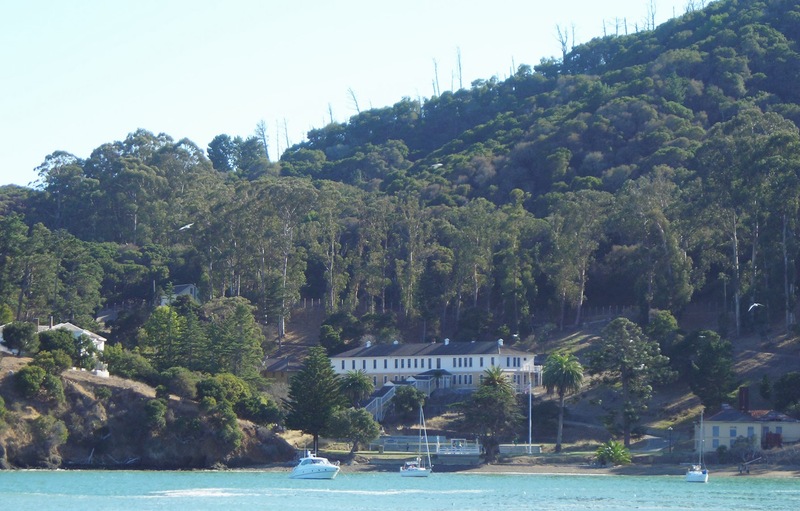 I am happy I had the opportunity to visit Angel Island because my stepsons' grandfather, who was from Punjab, India, came through the island when he arrived in the United States in the 1920's. Through research I have learned he was not detained, even though Indians were classifed similarly to Chinese (as "Asians" under the Chinese Exclusion Act), because he came as a student, not an immigrant. But just knowing that he went through there made the visit special. CGS has posted several excellent photographs of the day taken by Judy Bodycote on its blog. The one flaw in my day was the climb from the ferry dock at Ayala Cove to the immigration station. I swear I was told it was about a mile, but it's actually closer to a mile and a half, and most of it is uphill. My poor little old knees were not happy. The next time I go to Angel Island, I think I'll take the tram to the immigration station instead. The Fritz Bauer Institute, dedicated to studying the Holocaust, has posted 100 hours of audio recordings of Auschwitz survivors and guards online. The recordings are from the 1963–1965 Frankfurt trial of Auschwitz guards and includes testimony from survivors along with responses from the defendants. An article about the release of the records is on Yahoo!. When doing family history research, I often caution people not to worry about spelling. Until well into the 20th century, most people were either poorly educated or functionally illiterate. Spelling was done phonetically, and a person's name could be spelled multiple ways within one document. In the United States, one of the things that helped codify spelling was passage of the Social Security Act. Suddenly you had to prove you were a specific person, the same person every time. Consistent spelling made that a lot easier. But what if the problem isn't spelling, but pronunciation? I traced one of my family lines back to a man named Justus Fox in Philadelphia. He was born in one of the German states and immigrated to the British colonies in North America around 1750. The family name was formerly Fuchs and was Anglicized to Fox. When I began to find information about Justus Fox, my mind automatically pronounced his name as "justice." My first language is American English, and it came naturally. But then I started thinking about it. "Justice" (which I have seen spelled as Justus) is seen as a given name in today's society, but it didn't make sense for a German-born man in the mid-18th century. And then I started to think about German pronunciation. The letter J does not sound the same as in English. It has a Y sound; for example, the German word for yes, ja, is pronounced "ya" in English. When I applied that logic to my ancestor's name, I got "yustus" and was easily able to figure out that Justus is the German equivalent of the name Eustace. I also found there have been many well known men named Justus. Another instance of pronunciation affecting research was when I was working on my half-sister's family. Her mother's ancestry was all Irish all day long, both sides. My sister's grandmother had done some work, which my sister gave me as a starting point. 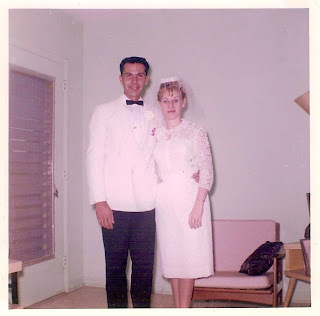 Her grandmother didn't have many documents but had written down what information she knew about births, marriages, deaths, and family stories. One story her grandmother wrote about was a portrait of her mother that had been painted by a Mr. O'Kane. 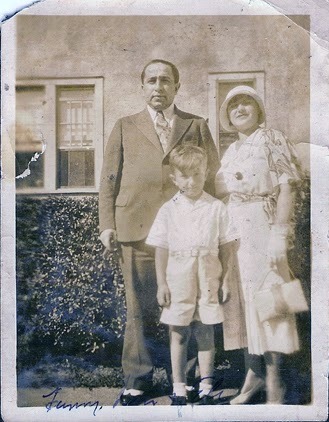 I thought it was interesting but, beyond wondering whether the portrait was still in the family somewhere, it didn't seem like anything that would help with my research. I started looking for the family in censuses and found several I was sure were the correct people. But I found one I wasn't sure about. The husband was gone, which was plausible. The mother, listed as a widow, looked right, and one person listed as her child seemed to be correct, but another person that should have been a child was listed last in the household as a boarder. But all of the names were common Irish ones, and I didn't see enough for me to make a determination. So I saved that census and looked for other documents. One day I pulled out the census page again and tried to figure out if there were other clues I could use to decide if it was the right family. This time I looked at all of the boarders listed in the household. The name Okane caught my eye, and I remembered the story about the portrait. When I read the rest of the line, I discovered the individual was a boarder, Japanese — and a painter. My sister's grandmother probably interpreted the name Okane in the context of her Irish background and thought it was Irish, with an O'. But now I'm pretty sure that I found the right family. Do you have any interesting or entertaining pronunciation stories from your research? Or am I the only geek who thinks this way? 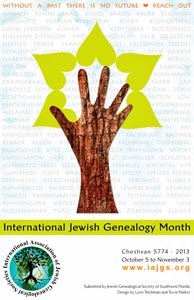 International Jewish Genealogy Month (IJGM; http://www.iajgs.org/jgmonth.html) is coming soon! It is celebrated during the Hebrew month of Cheshvan, which this year runs from October 5 through November 3. The purpose of IJGM is to promote the hobby of genealogy and to make people aware that there is a local Jewish genealogical society that can help them start their research. We also honor our ancestors through our family history research. 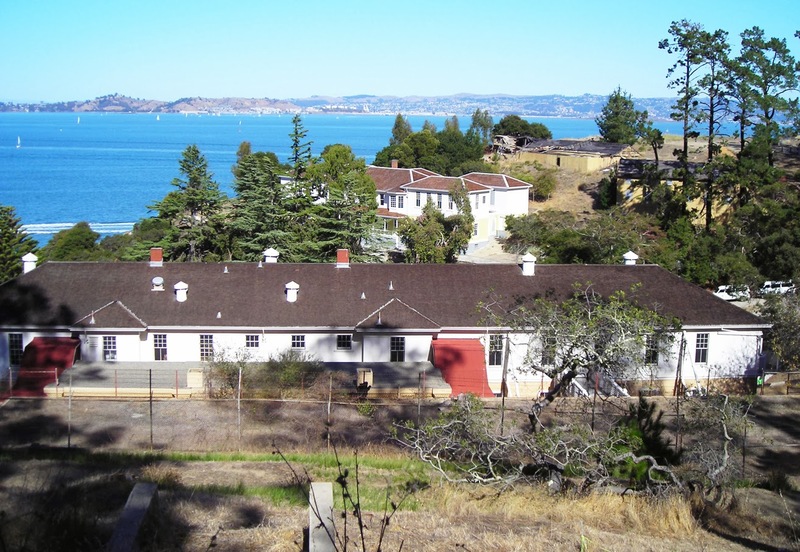 This Saturday, October 5, the California Genealogical Society is presenting a family history day on Angel Island, sometimes called the Ellis Island of the West. 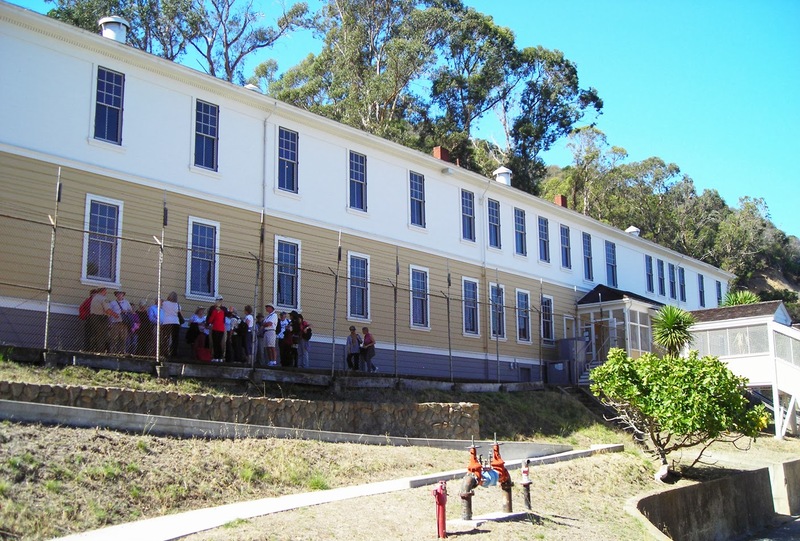 SFBAJGS and the Angel Island Immigration Station Foundation are cosponsoring the event. Speakers will discuss Chinese, Japanese, and Jewish immigration through the island. 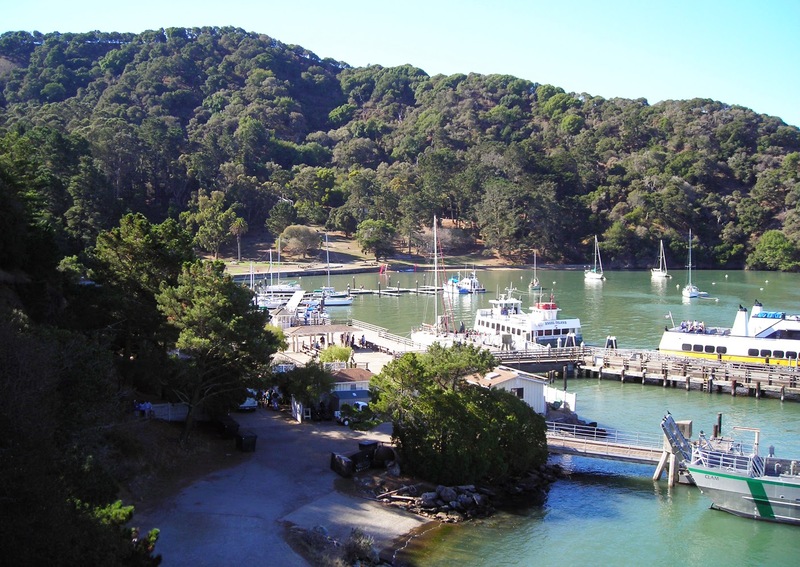 The event runs from 11:30 a.m.-2:30 p.m. Angel Island is accessible by ferry from Oakland, Alameda, Vallejo, Tiburon, and San Francisco. The immigration station is about a one-mile walk from the ferry dock at Ayala Cove; shuttle service is available for those who do not wish to walk. For more information, visit the California Genealogical Society page about the event. On Wednesday, October 16, I will teach an introduction to Jewish genealogy class at the Oakland FamilySearch Library from 6:30-8:00 p.m. Topics covered will include geography, languages, how Jewish culture and history affect family history research, and more. 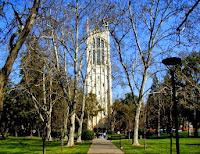 The library is at 4766 Lincoln Avenue, Oakland, CA 94602. On Sunday, October 20, SFBAJGS will have a meeting at the Oakland FamilySearch Library. We start welcoming people at 12:30 p.m. From 1:00-2:00 p.m. speaker Lisa Gorrell will teach about using city, county, and rural directories in your research. Directories can hold a lot of information to help you learn more about your family members' lives. After Lisa's talk, we will have use of the library until 4:00 p.m.
And on Monday, October 21, SFBAJGS will meet at Congregation Beth Am, 26790 Arastradero Road Room 5/6, Los Altos Hills, CA 94022, with the doors opening at 7:00 p.m. From 7:30-9:00 p.m. I'll talk about using online newspapers for genealogy research, with several Jewish examples. I'll give an overview of what newspapers are available online and show techniques to improve your search results. For more information, visit the SFBAJGS calendar at http://www.jewishgen.org/sfbajgs/calendar.html. All the events are free, and everyone who is interested is welcome to attend. If you have been thinking about researching your family history, this would be a great time to start, and these talks will help get you going.